On Friday, December 1st, 2017 BMG will be releasing Gary Moore’s Blues And Beyond – a collection of his powerful and emotive blues studio recordings. Blues And Beyond will be made available as a 2CD, 4LP and deluxe box set which will consist of the 2 CDs plus a further 2 CDs of newly mixed and mastered live concert recordings , with two previously unheard song versions. This is the first time that this concert has been made available, ANYWHERE! The box set will also house the brand new book I Can’t Wait Until Tomorrow and reproductions of rare memorabilia. 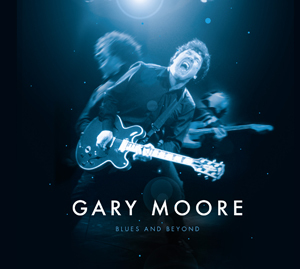 BMG proudly release Gary Moore’s Blues And Beyond, a remarkable collection of his powerful and emotive blues studio recordings. Blues And Beyond is released on double CD, 4 LP and as a box set, which includes unreleased live recordings and the official Gary Moore biography I Can’t Wait Until Tomorrow written by Harry Shapiro. Best known for his evocative solo hits, "Parisienne Walkways" and "Still Got The Blues" (live versions feature in this set), and his on/off membership of THIN LIZZY, Gary Moore’s solo career comprises over twenty albums. Throughout the 1980s, Gary moved up the rock hierarchy, but turned his back on what he regarded as the empty flash of metal and reverted to his heart music – the blues – where ironically he scored his biggest commercial success through his 1990s and 2000s blues albums. "That's Why I Play The Blues"
"My Baby (She's So Good To Me)"
"Just Can't Let You Go"